Breeding Jack Dempsey will require a lot of patience because the biggest obstacle towards success is actually having a mature breeding pair and the hardest part is finding a compatible partner. Most of the time, the reason why breeders fail is because most of the identified fish is hand-picked and then selected to be added together usually after their sexual maturity age. For me, the best chance to end up with a breeding pair is to purchase a few juvenile jack dempsey (numbering about 6 to 7) and then put them together in the same tank and then raise them to become adult fish. At the same time, by doing so, you will get the chance to let the natural selection process take place to have a breeding pair later part. Usually, what you will notice is that, most often the healthiest and dominant opposite sexes will pair up together while those that were rejected will be singled out and bullied upon. After you notice that you have a compatible jack dempsey pair swimming together, you should take the effort to remove the other fish. It is always a mistake made by breeders to presume that a fish, which has the most desirable characteristic such as bright colors and balanced body size should be the best pair and hence put them together in the same tank hoping that the fish would pair up. However, what you will find is that most of the time, the fish will reject one another and fighting will ensue resulting in injury or sometimes death. It might also be a viable idea if you decided to pair up a larger fish with a smaller sized fish because the larger one is usually the male while the smaller one is the female. There are exceptions of course, which is still possible if you intend to introduce the fish after their maturity age but however, the chances for them to turn into a pair might be lower. The drawback to doing this is that, you will need to find a number of potential jack dempsey fish, guess their sexes, put them in the tank and then later part observe carefully whether they will turn hostile towards each other. In the end, doing all these might probably become a cumbersome and long process and there is no guarantee it will be a success. 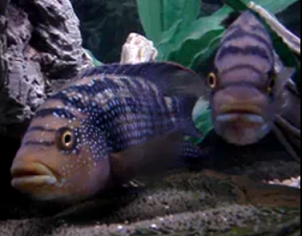 Find out more about caring for jack dempsey fish and how to prepare and setup a cichlids tank.